Forest Men's Kitchen is an Incorporated not for profit Association, based on Sydney's Northern Beaches. Our aim is to provide an environment for older men to gather and prepare a meal together, guided by an experienced Cooking Instructor. Our wish is that the blokes who join us will not only learn some basic cooking skills and how to follow a recipe, but also make some great mates in the process. 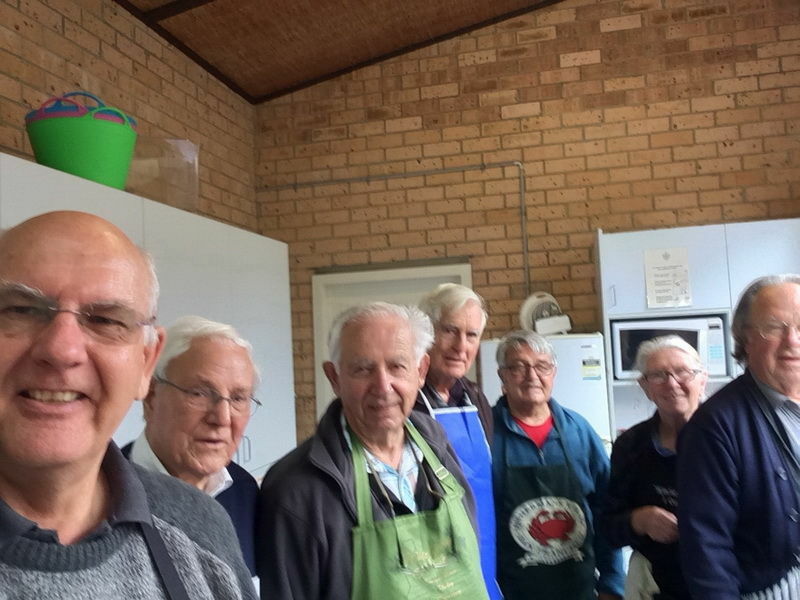 The association runs several Kitchens which serve to provide a convenient location for men all over the Northern Beaches Council local government area. Our cooking program, provides you two important benefits, summed up by our catch-cry: Old Dogs. New Tricks. Great Mates. By developing kitchen skills (New Tricks) older men are better able to support themselves and their family. You will also learn important food safety lessons, so the quality of food you prepare will be safe to eat, nutritious and delicious. Regular attendance at our monthly cooking sessions will forge new friendships (Great Mates), and will provide a forum to discuss common issues associated with life as a single male, living alone or with a disabled wife and, well, about being an Old Dog. Attending our monthly cooking sessions and attending our public cooking events members become more socially and community aware. Forest Men's Kitchen members have a more active and rewarding life by being better informed on how to make healthy food choices, prepare nutritious and healthy food themselves and through having shared their challenges with their peers. Having developed confidence in the kitchen you will be more likely to remain in your own home longer as you will be better fed, safely. And having developed some new Great Mates, you will be less socially isolated. 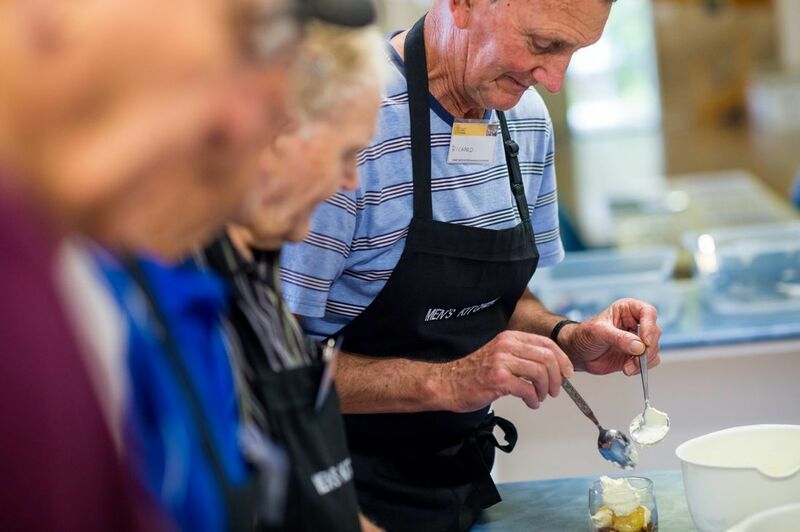 In 2010, NSWH commenced a Men's Carer Cooking Program in the Tramshed Community Centre in Narrabeen. After the Tramshed closed its operations for renovations the group relocated to Forestville and supported by Frenchs Forest Rotary formed Forest Men's Kitchen Association Incorporated as a not-for-profit organisation. Our association aim is to establish and support safe, supportive and instructive environments where older men learn cooking skills. Our target demographic is those men over sixty years, of the 30,000 living on the Northern Beaches, who are looking to increase their confidence in the kitchen, or have had to take over the role of preparing meals, and most importantly, would like to join a group of men who enjoy each other's company while preparing a meal. When we moved, just six members from the Tramshed, plus our Executive Cooking Instructor relocated to the Forest area. At the end of December 2016 we had more than doubled that membership and gained a second Cooking Instructor. By the end of 2017 we had three cooking instructors, three monthly cooking sessions and almost 30 members. In April 2018 the Northern Beaches Mayor came to lunch, which was a great opportunity for us to show off our cooking skills and have Cr Regan appreciate what the Council had been supporting over the last couple of years. At that lunch several photos were taken and in September an article appeared in the Peninsula Living magazine about the Men's Kitchen. That one article attracted about 25 new members. By the end of 2018 we had opened our Warriewood Kitchen and were conducting two Cooking Sessions per month there. Our membership had again doubled to nearly 60. In March 2019 we opened our third Kitchen, this one in Curl Curl bringing our number of Cooking Session a month to six. Throughout 2019 we will be looking for new members and more Cooking Instructors to help us continue to grow.